ONGC Scholarships. ONGC Scholarships for SC and ST Students. 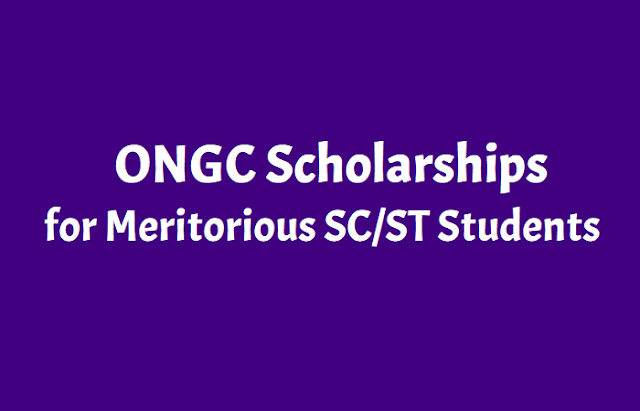 ONGC Scholarships to Meritorious SC/ST Students. Name of The Scholarship: ONGC Scholarships. 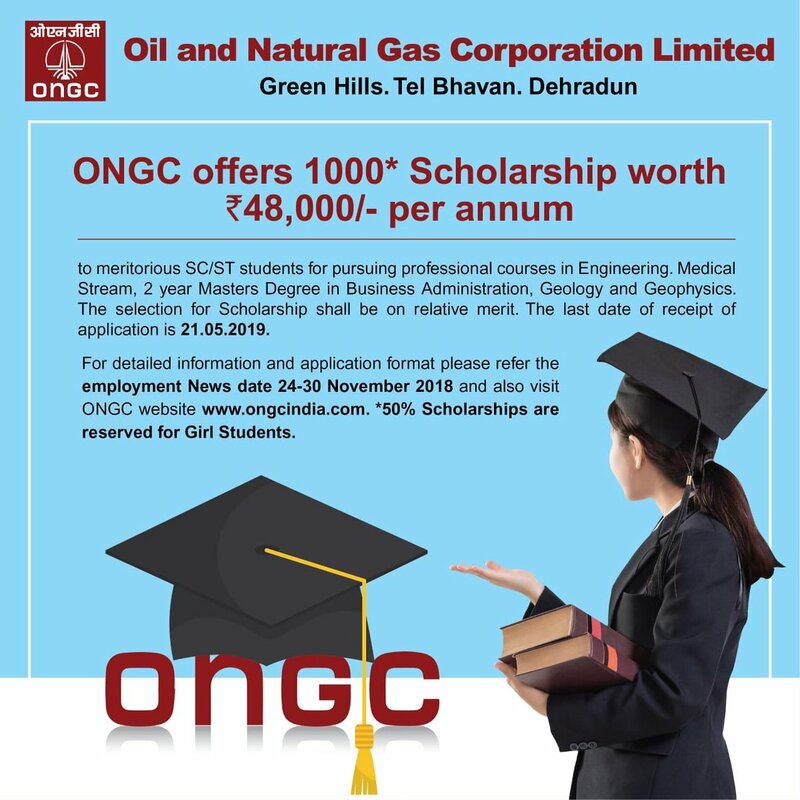 Oil and Natural Gas Corporation (ONGC) has announced that 1000 scholarships worth Rs.48,000 per annum each to Scheduled Caste(SC) and Scheduled Tribe(ST) students in various courses. The scholarship will be given to students pursuing courses in engineering, medicine as well as master courses in business administration, geology and geophysics. 50 percent of these scholarships are reserved for girls students. The details as followed. 1. The scholarships are open for studies in India and for Indian nationals only. Candidate should be a student of 1st year of Graduate Engineering or MBBS courses or 1st year of Masters degree in Geology/Geophysics or MBA. The scholarship shall be admissible only for pursuing full time regular courses by ISC /CBSE /MCI AICTE /UGC/Association of India Universities/State Education Boards/State Government/Central Government. 2. Students pursuing four years Engineering/MBBS courses and Two years Masters course in Business Administration & Masters degree in Geology/ Geophysics are eligible. Candidate should have obtained minimum 60% marks in 12th class for Engineering and MBBS disciplines. Similarly 60% marks are necessary in graduation for P.G. Courses i.e. Geology/Geophysics/MBA. Overall Grade Point Average (OGPA/CGPA) of minimum 6.0 in 10 points scale of grading system. 3. The specific zone where a student can apply for scholarship shall be decided on the basis of the location of University/College/Institute in which the student was studying for the qualifying examination (i.e. 12th class for Graduate courses and Graduation degree for Post Graduate courses) irrespective of the domicile of the student. Gross annual income of family of the candidate from all sources should not be more than Rs 4.50 lakhs per annum (i.e. Rs.37,500/- per month). 4. The candidates should not be availing or intend to avail any other financial assistance/scholarship from any other source. However, in case of student of getting fee waiver/ reimbursement of tuition fees from any of the State governments are eligible for applying for the scholarships. The age limit of the applicant is maximum 30 years as on 1st of October,2018 for the Academic Session. The final list of the scholarships beneficiaries shall be posted on website www.ongcindia.com by the second week of December of every year. The continuation of scholarships once awarded shall be subject to satisfactory performance in each year’s annual examination and conduct of the candidate. Scholarship shall not be paid for the year where the student fails to maintain the scale of 5 grade points out of 10 grade points scale or secure less than 50% in the examination, as the case may be. The award of the scholarship shall not confer any right of employment with ONGC group of companies or its joint ventures. The candidate fulfilling the above criteria may submit their application in the prescribed ‘Application format’ which can be downloaded from ONGC’s website www.ongcindia.com. Complete application with all the supporting documents as mentioned in the application form duly certified and forwarded by their Head/Principal/ Dean of the Institute/ College/University, should reach the designated office of ONGC as per the details given in application Format. ఆయిల్ అండ్ నేచురల్ గ్యాస్ కార్పొరేషన్ (ఓఎన్‌జీసీ) స్కాలర్‌షిప్ పొందడానికి బ్యాచిలర్ డిగ్రీ, పీజీ / ఉన్నత విద్యలు చదువుతున్నప్రతిభావంతులైన ఎస్సీ/ఎస్టీ విద్యార్థుల నుంచి దరఖాస్తులను ఆహ్వానిస్తున్నది. వయస్సు: 2018 నవంబర్ 1 నాటికి 30 ఏండ్లకు మించరాదు. 1. తల్లిదండ్రుల వార్షిక ఆదాయం ఏడాదికి రూ. 4.50 లక్షలు దాటకూడదు. 2. మొత్తం స్కాలర్‌షిప్స్‌లో బాలికలకు 50 శాతం కేటాయించారు. 3. ఆర్థికంగా వెనుకబడిన కుటుంబాల విద్యార్థుల ఉన్నతవిద్య కోసం ఓఎన్‌జీసీ ప్రతి ఏడాది ఈ స్కాలర్‌షిప్‌లను ఇస్తుంది. 4. దేశవ్యాప్తంగా ఐదు జోన్లలో ప్రతి జోన్‌కు 200 స్కాలర్‌షిప్స్‌ను కేటాయించారు. 5. సౌత్ జోన్ పరిధిలోని ప్రాంతాలు- తెలంగాణ, తమిళనాడు, కేరళ, కర్ణాటక, ఆంధ్రప్రదేశ్, పుదుచ్చేరి, లక్షదీవులు, అండమాన్ నికోబార్ దీవులు. 6. కుటుంబంలోని ఒక్కరికి మాత్రమే స్కాలర్‌షిప్ ఇస్తారు. Last date for submission of duly completed application form is 21.05.2019.